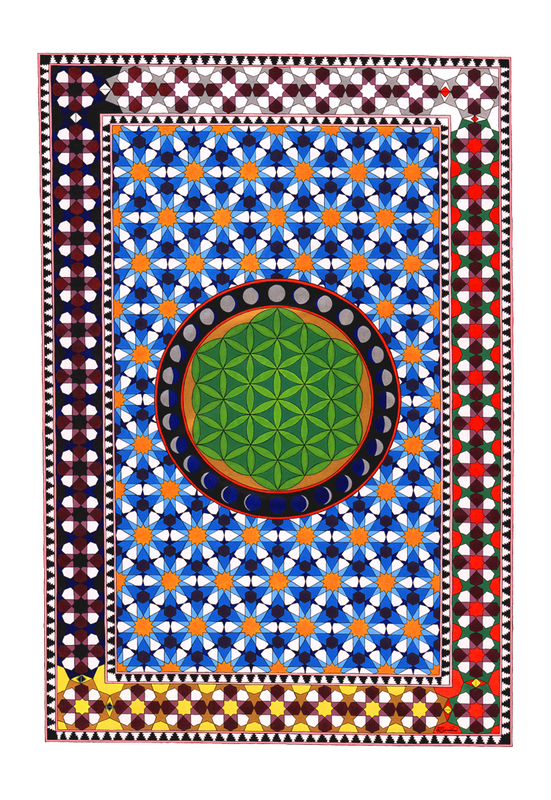 A journey through Morocco and a love of Sacred Geometry. In the centre there is the Earth, green to represent all growing things. Behind is the golden disk of the Sun upon which all life on Earth depends. Surrounding are bands of red to symbolise the red blood that flows through all our veins and binds us all together. The phases of the Moon which give pleasing variations are there also. Blue is the water, hexagonal in structure like the snowflake crystal and the beehive, shimmering reflections of the Sun. Encompassing all are the four seasons Ouroboros forever moving forwards.